David Little is Associate Professor Emeritus and Fellow Emeritus at Trinity College Dublin, Ireland. He has been a regular contributor to the Council of Europe's language education projects since the 1980s. In 2010, the National University of Ireland awarded him an honorary doctorate in recognition of his contribution to language education in Ireland and further afield. Lienhard Legenhausen is Professor Emeritus, Westfälische Wilhelms-Universität Münster, Germany and Visiting Professor, National Bohdan Chmelnytzkyj University of Cherkasy, Ukraine. 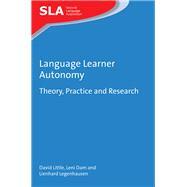 He is a committee member of IATEFL's Learner Autonomy Special Interest Group.